I make these all the time for my little one. He loves them, especially with a couple of strawberries on the side. They freeze really well. Sift flour, baking powder, bicarb, cinnamon and salt into a large bowl. Stir in sugar. Combine melted butter, honey, milk, vanilla, eggs and mashed banana in a large jug. Whisk until well combined. Make a well in the dry ingredients. Add egg mixture and mix until just combined. Spoon mixture into prepared patty pans. Bake for 20mins or until cooked through when tested with a skewer. Cool in pans for 5 mins before turning out on to a wire rack to cool. As you can see from the photo, we got halfway through eating this before I remembered to take a photo! This is such an easy recipe with only three ingredients!!! That’s right – only 3 😀. Definitely suits my preference for simple… It tastes pretty damn good too – it has a nice light texture and flavour. For those who like their cakes to look fancy, you could try decorating with chocolate curls and/or some fresh berries. Preheat oven to 170 degrees C. Grease and line a small springform pan and place in a baking tray. Separate the eggs and place egg whites in the fridge until needed. Melt chocolate in a medium sized bowl placed over a simmering pot of water. Add cream cheese to the chocolate and mix until melted and combined. Remove from heat and mix in the egg yolks. Whip the egg whites to firm peaks. Add 1/3 egg whites to chocolate mixture and fold through until well combined. Repeat with remaining egg whites, half at a time. Pour into prepared cake tin. Add hot water to the baking tray and place in the oven. Cook at 170 degrees C for 15 minutes. Reduce heat to 160 degrees C and bake for a further 15 minutes. Turn oven off and leave cake in oven for a further 15 minutes. When cooled slightly, remove from cake pan and cool in the fridge until ready to eat it! These are my new everyday alternative to bread… Breakfast, lunch or dinner. 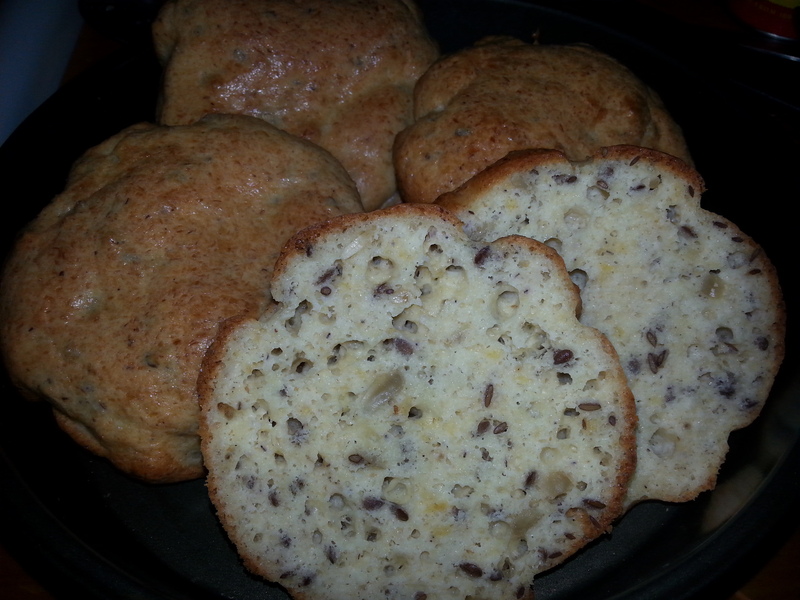 They have a texture similar to crumpets, and they hold together beautifully. I took one to a bbq recently and grilled it on the bbq – it tasted so good, I’ve pretty much been grilling them every time since (but you don’t have to!). I’ve used these as a burger bun, toasted with cream cheese, mini pizza base or just with lashings of butter and peanut paste (yum)! Preheat oven to 200 degrees C. Mix almond flour, seeds, psyllium husk, salt and baking powder in a bowl. Add eggs, olive oil and sour cream and mix together. Cut dough into 4 pieces (this will be a fairly soft damp dough). Shape into balls and place in a cake pan (you will need a pan with sides – not a tray). Bake in preheated oven for 20-25 minutes. You can spoon the mixture into smaller individual pans (I do – its easier than playing with a sticky dough). You must still leave the mixture to sit for at least 5 mins. I usually add garlic salt or a spice mix as it adds a nice bit of flavour. I’m going to try jalapenos next! 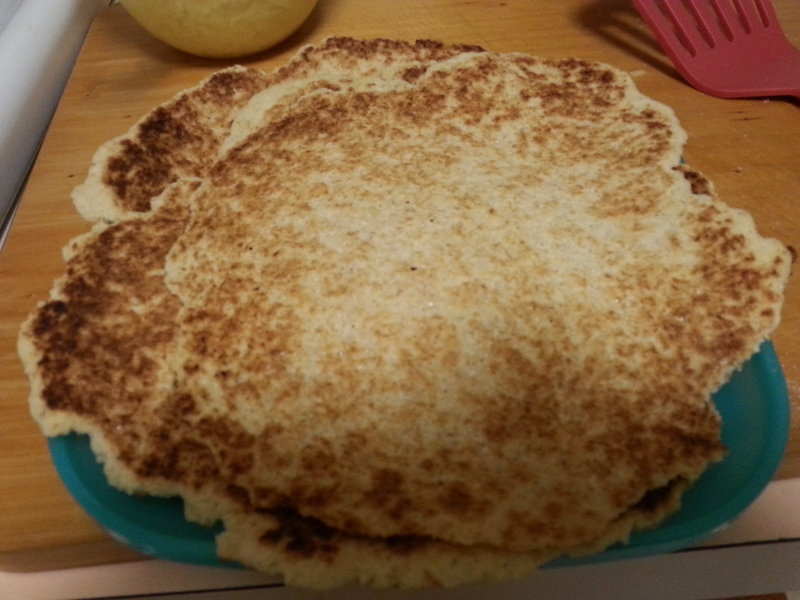 I’ve been following a low carb diet for a few months now and while I haven’t really missed bread all that much, I was missing my tortillas! I found this recipe which works really well. It’s got a different taste and texture but holds together really well, and also works pretty well as a pizza base. However, don’t try using it in tortilla pie or enchiladas etc… It kind of disintegrates during cooking! Keep tortillas in the freezer, as they don’t keep well. I find popping them under the sandwich press for about 30 seconds or so is enough to defrost them quickly and they cope well with being frozen. Is there anything better than fresh, home baked bread? This is another of Dad’s recipes that we all love. 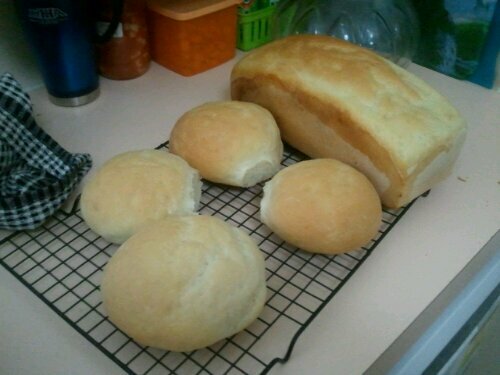 I also made bread rolls out of the same batch as I only have 1 bread tin. Mix together the sugar, water and yeast in a jug. Set aside for 10mins. Yeast mixture should be frothy after 10mins. Place all the remaining ingredients in a large bowl. Add the yeast mixture and mix to form a dough. Turn dough out onto a floured board and knead until dough springs back and is no longer sticky – this usually takes up to 10mins. Place the dough into an oiled bowl and cover with a teatowel. Set aside in a warm spot to rise for 1hour. The dough should double in size. Punch down the dough and knead again smooth. Divide dough in half and form a log. Place dough in a greased, floured bread tin. Set aside to rise for another half an hour. Spray dough liberally with water and place in a preheated oven at 220*C for 30mins. If making bread rolls, bake for 15mins. Note – Bread improver can usually be found at the supermarket. If you can’t, you can substitute it with soy flour. Thought I’d get back in the game and post a favourite recipe of mine – Banana bread. 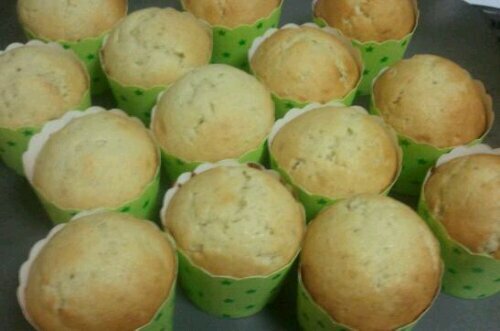 I usually bake this as a whole cake in a loaf pan, but picked up these cute paper cake cups and tried them out. This is a fantastic way of using up those overripe bananas. Combine milk and lemon juice in a small bowl. Place peeled bananas in a large bowl and mash them. Add sugar, sifted flour, lightly beaten eggs, softened butter & milk and lemon juice mix. Mix together until smooth. Place in a well-greased cake tin. Bake in a slow oven for 1 3/4 hours or until cooked. Cool in tin for 10mins before turning out onto a wire rack to cool. 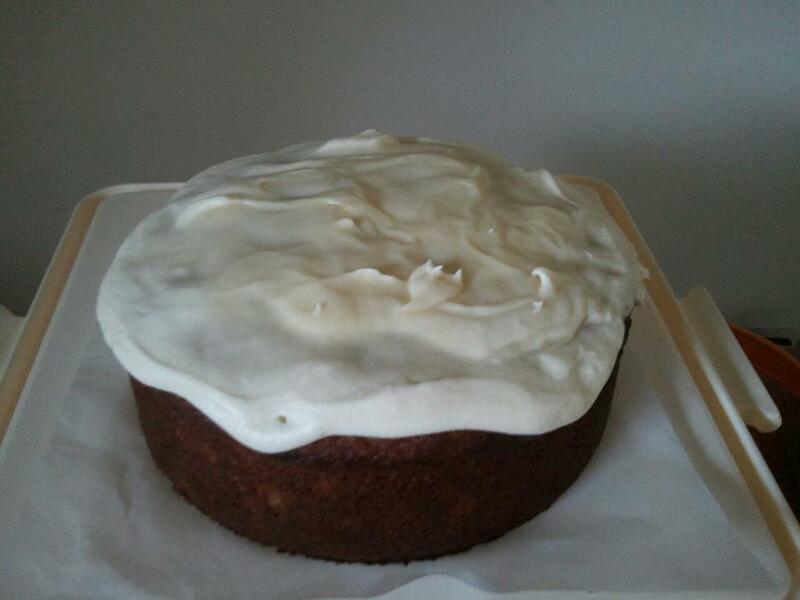 I usually don’t ice this, but it is lovely with a cream cheese frosting for something special! Variation – add some chopped walnuts to the mix. If making into smaller cakes, you will need to adjust the cooking time. Preheat oven to 180°C. Grease a deep 20cm square cake pan; line base with baking paper. Drain pineapple over medium bowl, pressing with back of spoon to drain. Reserve ¼ cup of the liquid. Sift flours, bi-carb soda, spices and sugar into a large bowl. Stir in pineapple, syrup, coconut, banana, egg and oil. Pour into prepared pan. Bake for about 40mins. Stand cake in pan for 5mins before turning out onto a wire rack to cool. Spread cold cake with frosting. Cream cheese frosting – Beat butter, cream cheese and vanilla until light and fluffy. Gradually beat in icing sugar. I found the recipe in a Women’s Weekly masterclass cookbook in the library. It takes just 30 minutes to cook. Preheat oven to 180°C. Grease a deep 20 cm round cake tin. Line base with baking paper. Beat butter, vanilla, sugar and egg in a bowl with an electric mixer until light and fluffy. Stir in sifted flour and milk. Spread mixture into pan; bake in oven for about 30 mins. Stand cake in pan for 5 mins before inverting onto a wire rack. Brush hot cake with melted butter. Sprinkle with combined cinnamon and sugar. Serve warm.